Plum Pretty Atkinson Kitchen — Plum Pretty Decor and Design Plum Pretty Decor & Design Co.
1. Place your "tools" container, the oil and vinegar containers, salt and pepper shakers on the large wood slice you canisters are now on. Then place a small container with some greenery. This creates an easy grab station for cooking essentials. Beside of this "tool"container place your cutting board cook book holder with your favorite cook book on it. 2. Place your canisters in descending order- tallest next to stove. But center them in the space. Place some flowers or greenery in your blue vase and place beside them. Then place your spoon rest on the counter next to stove. 3. Place your paper towel holder near sink - CLICK HERE for the paper towel holder I have in my kitchen and love. Prop fresh baked pie sign up again the wall. Place a large cutting board behind the sign so you can still read the letters. Next to it place the pour pitch with flowers of greenery. Add in a candle for interest. Place white bowl on wood slice and fill with green apples or fresh fruit and place next to the vignette you create. Layer in your "tile print" with this vignette- placing it behind or to the side. 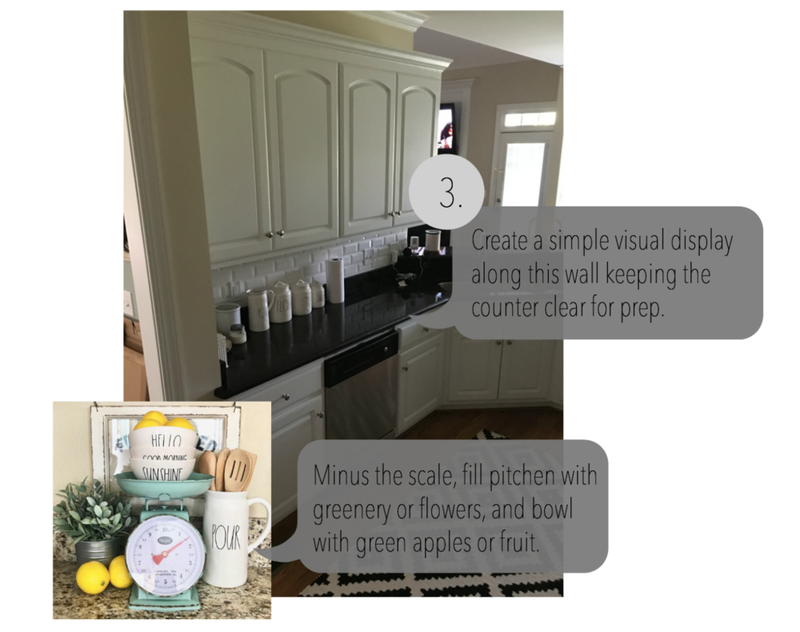 You can use the pineapple in the vignette created with the sign and pitcher or simply place it next to the sink to add some white glass in that area. If you would like to purchase a bread board you can layer that behind your sign.